I wanted to make a gift for each of them as a thank you. First I was thinking a mini quilt but then opted for pillows. 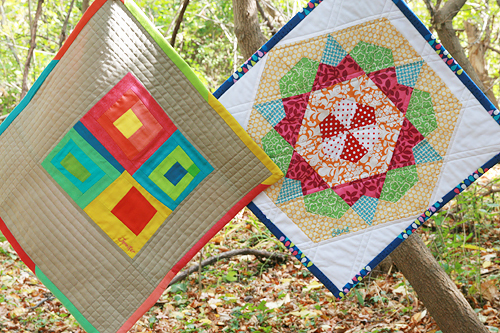 Because, as Amanda says, anything can be a mini quilt, even a pillow! In Salt Lake City, someone smart said that life would be a lot easier if everyone you made a gift for had a Flickr Favorites photostream. How.true. I did some snooping in Jennifer's photo stream and noticed a lot of work by Stitch in Dye's Malka Dubrawsky. Luckily I just took a class on Improvisational Piecing by Malka so I sort of knew how to start. I made four improv blocks, each around 5 inches. 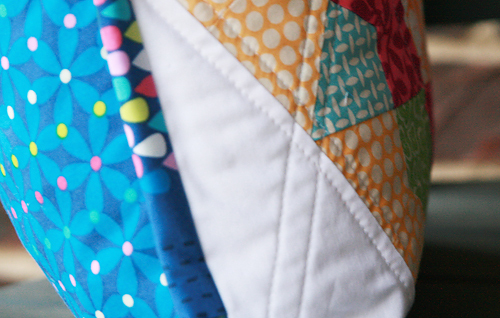 There is a bit of curved piecing - yes, that's on purpose! LOL A bit of adding fabric to the square to make it fit to the block next to it. 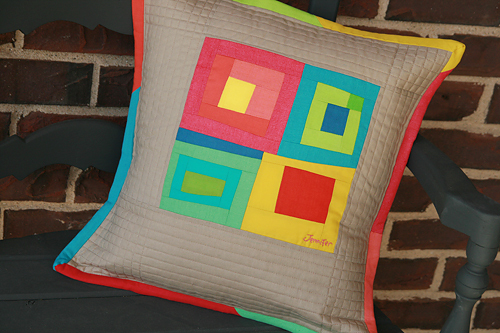 Then I off-centered the block for the pillow. I'm 95% certain the tan is an Essex Linen. I wish I had marked it when I bought it! Then I embroidered Jennifer's name on the pillow to personalize it a bit. I quilted the front with straight lines, about 1/2" apart, in the sashing. 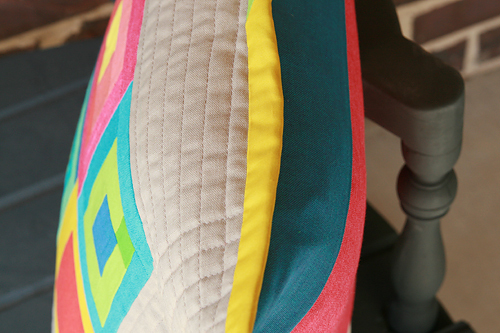 I made a scrappy binding for the pillow, love scrappy binding! When I was looking through Elena's favorites, I noticed she liked bright colors and stars...she had a lot of stars in her Favorites! Remember that tutorial on Y-Seams last week? 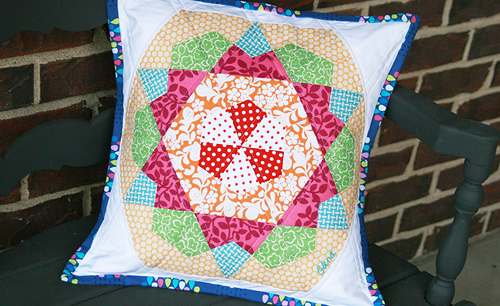 I needed to learn those to make her pillow, which is a block from the Jazz Hands quilt in Material Obsession 2. 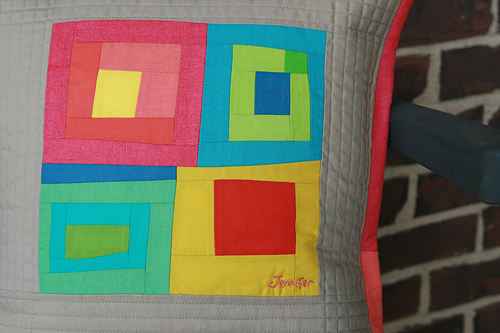 I quilted Elena's pillow using straight lines on either side of the diagonal seams. Then I also embroidered her name on the front. 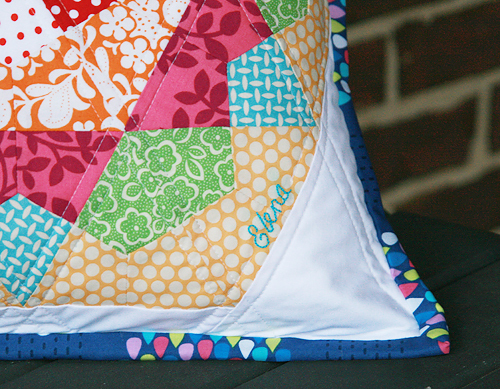 The binding and backing of Elena's pillow are both from Erin McMorris' Summersault fabric line. Both pillows are a bit smaller than 18" (I like the overstuffed look...I hope they do too!) Jennifer and Elena received their pillows this week so I'm not spoiling the surprise. Thanks again to both of you!